Kryptonian Warrior: DC's Booster Gold Character Headed To SyFy In His Own TV Series? DC's Booster Gold Character Headed To SyFy In His Own TV Series? It was recently reported that SyFy has ordered a pilot script for a one-hour drama based on DC Comics' Booster Gold character. The project, which hails from Greg Berlanti's Berlanti Productions in association with Warner Horizon Television, will count Berlanti (Brothers & Sisters, No Ordinary Family, Green Lantern) as an executive producer. Fringe's Andrew Kreisberg, who collaborated with Berlanti on ABC's Eli Stone, is on board to pen the script and executive produce. DC Comics will also receive an EP credit. 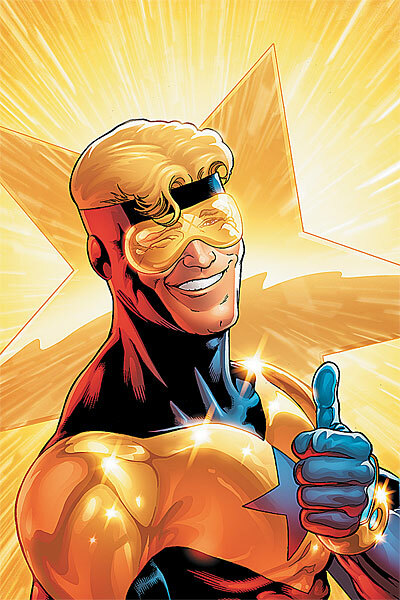 Booster Gold is a washed up athlete from the future who manages to travel back to the present and tries to become a super hero who's primary goal is fame and fortune. Of course over time Gold learns that being a hero about more than making the 11 o'clock news. Booster Gold made an appearance in the final season of the CW's Smallville. The character was played by actor Eric Martsolf. No word if Martsolf is being looked at to reprise the role for this new series.